Thanks to those creepy steel pinchers we all encountered during those tests in elementary school, we know that body fat percentages are a more accurate measure of physical fitness than weight. Some of us (take me for example) know that being all yoked out probably means we weigh more than we maybe should for our age/height, but only on paper. Conversely, because fat is lighter than muscle, maybe some of us think we’re in better shape than we should. Still, measuring your body fat at home can be a hit-or-miss proposition. Low-tech options tend to be less accurate, while really accurate methods are either difficult to use, expensive, or both. The device, called the “Aim,” could be easily mistaken for a smart phone and uses something called electrical impedance myography (EMI), developed by Skulpt co-Founder Dr. Seward Rutkove of Harvard Medical School. The Aim sends a small current through through the body wherever it makes contact and its sensors can distinguish both muscle from fat, and weaker muscles from stronger ones. Algorithms convert the data into two metrics: fat percentage and “muscle quality,” a measurement of strength and definition. And measuring is easy. Just press the Aim against your body and wait a few moments for the data. It can be used at home, in the shower, or at the gym. And because we live in an age where people really, really love their phones, nobody will question why you appear to be rubbing yours over every inch of available flesh. 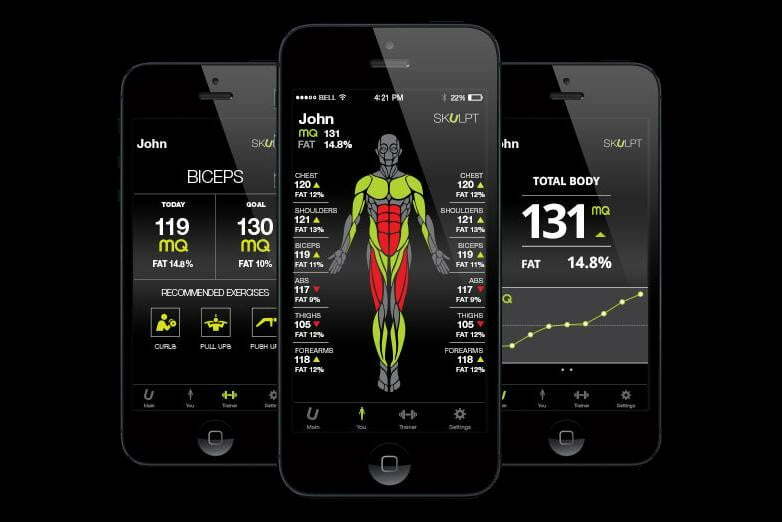 The Aim can track progress in specific muscle groups over time on a “personal online dashboard” and mobile app, allowing users not only the opportunity to understand total body fat composition, but get very, very specific about particular muscles in tailoring workouts. Better information means more efficient workouts, and more efficient workouts lead to a healthier body, all of which gets you one step closer to taking your shirt off and looking just like me.